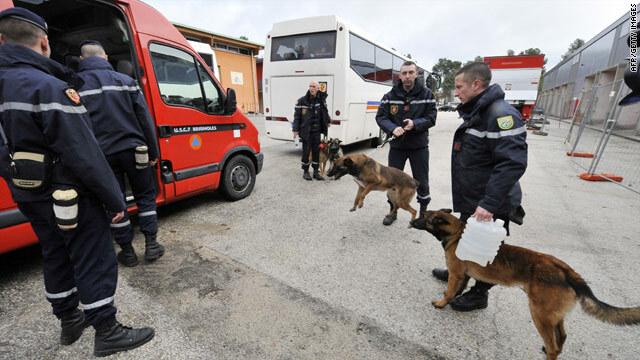 French search teams with sniffer dogs prepare to leave for Haiti, as nations rally to offer assistance. United Nations secretary-general calls on world to "come to Haiti's aid in this hour of need"
Pope lamented Haiti's "tragic situation (involving) huge loss of human life"
(CNN) -- United Nations Secretary-General Ban Ki-moon issued an urgent call Wednesday to the international community to assist Haiti, as the Caribbean island counted the cost of a devastating earthquake the day before. Tuesday's 7.0-magnitude quake struck shortly before 5 p.m. local time on Tuesday, and was centered about 10 miles (15 kilometers) southwest of the capital Port-au-Prince, the US Geological Survey reported. The International Red Cross estimated that over three million people in the impoverished nation had been affected. "There is no doubt that we are facing a major humanitarian emergency and that a major relief effort will be required," Ban said in a statement on the U.N. Web site. The U.N., he said, has mobilized an emergency response team to help coordinate humanitarian relief efforts and is expected to be on the ground shortly. He also reported that the U.N. mission chief and deputy special representative in the country were unaccounted for, after much of Port-au-Prince was reduced to rubble. "Many people are still trapped inside," the secretary-general -- who has been in close consultation with the governments of Haiti, the United States and others -- noted. The U.S., meanwhile, was the first to offer help, as President Barack Obama said his government would "stand ready to assist the people of Haiti." The earthquake there seems "cruel and incomprehensible," he told reporters at the White House. He said it was crucial to assess the condition of the airport at Port-au-Prince, so aid can start coming in. "God has given, God has taken away," he said, urging that the living must be the priority right now. His French counterpart, Nicolas Sarkozy, expressed his support and solidarity with the Haitian people as France -- which governed Haiti until 1804 -- dispatched two planeloads of rescue personnel to the country from Guadeloupe in the Caribbean and Marseilles. His foreign minister, Bernard Kouchner, said the French embassy was in a "very serious state" and that the ambassador was "traumatized." But he said contact with the embassy had been re-established by telephone. The pope lamented Haiti's "tragic situation (involving) huge loss of human life, a great number of homeless and missing and considerable material damage," according to quotes from Agence France-Presse. "I appeal to the generosity of all to ensure our concrete solidarity and the effective support of the international community for these brothers and sisters who are living a time of need and suffering," the pontiff said at the end of his weekly general audience. He added that the Catholic Church's extensive worldwide charity network would be immediately activated to help the victims, Reuters.com reported. British Prime Minister Gordon Brown said "the thoughts of the world are with Haiti." Speaking during his weekly question and answer session in Parliament, he added that Britain "will be sending support." The Canadian government plans to send a reconnaissance team to Haiti to determine how best to assist the devastated country, the Canadian Broadcasting Corporation reported. Foreign Affairs Minister Lawrence Cannon said there has been no word on whether Canadians died in the quake, although roughly 6,000 Canadian citizens live in the country. Of these only 700 are registered with the Canadian Embassy in Port-au-Prince, Cannon said. Cuba's Foreign Minister Bruno Rodriguez told CNN his country has 344 doctors and paramedics based in Haiti and will be sending more to help its Caribbean neighbor.